Whew....I don't know about any of you, but dang, I'm glad it's almost Thursday (thank the sweet baby Jesus for personal days and 4-day weekends). This week has been cray-cray, both in good and bad ways, but after tomorrow, I am off to Atlanta to begin my wedding dress adventure with my sisters, mom, aunt, and some other fabulous ladies. I don't know what I'm more excited about though...the shopping or rubbing my sister's big preggo belly (side note: is it weird that I've been secretly picturing her as a care-bear and hoping that when I rub her belly it will glow or something??). 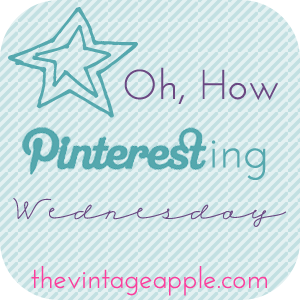 Okay, my strange mind aside, today I am once again linking up with Michelle at The Vintage Apple for OHPW....ya digg? This week, since I have dresses on the brain....that is my theme. Surprisingly enough, I have not been obsessing about this detail regarding the wedding. Though, I don't know exactly what I want, I know what I don't want....so, I figure I'll just avoid the things I dislike and I am sure to find something great. So, not really my personal style, but this one is totally gorgey, right?? Sweet. Southern. Adorable. But is it me??? So now I must know...what do my fab followers think? Do you love any of these dresses? Did you get your dream dress at your wedding, or if you're not married, what do you love in a wedding dress? Help needed!! These are all so great! I love the first 2, and have pinned them both, but I also really love that sweet southern one with the flowers and the backless ones! So many great choices!! Good luck picking out your dress!! They are all beautiful ... I love the first, and the last dress! Have a fun weekend dress shopping! Excellent idea my friend. This is exactly what I've been observing for for quite a time now... Thanks for this wonderful advantages to post that has been given by you!